Cupcake, my love: Ok, Ok, I Give In! Ok, Ok, I Give In! 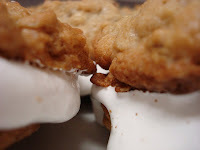 After making my ice cream sandwiches for TWD I began receiving requests for the recipe of the cookies that I had made. 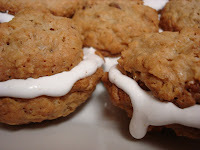 And let me just say that these were the best oatmeal cookies I have ever had. 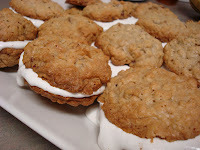 They were crunchy on the edges, but still soft on the inside and had a real yummy nutty oatmeal taste to them that rules over any other oatmeal cookie. So I decided that since so many people were interested in the cookies, and the simple fact that I forgot to post the recipe in my rush to make the "TWD Deadline", that I would make yet another sandwich and post the recipe. Adjust oven racks to the low and middle positions of the oven and heat to 350 degrees. Line 2 baking sheets with parchment paper. Whisk flour, baking powder, nutmeg and salt together in a medium bowl. Beat butter on medium speed until creamy. 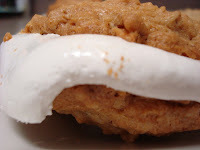 Add the sugars; beat until fluffy, about 3 minutes. Beat in the eggs one at a time. Stir the dry ingredients into the butter-sugar mixture with a wooden spoon or rubber spatula. Stir in the oats and nuts. Working with 2 TBSP of dough each time, roll the dough into 2 inch balls. Place on the baking sheet about 2 inches apart. Bake until cookie edges turn golden brown, 22 to 25 minutes, rotating the baking sheets front to back and top to bottom halfway through the baking time. Let cookies cool on baking sheet for 2 minutes. Transfer to wire rack and let cool at least 30 minutes.